University Press of Mississippi, 9781496804136, 306pp. These colorful figures yoked together two worlds not often connected--lazy rice farms in the bayous and swinging urban streets where ethnicities jazzily collided. A trip downriver to the hamlet of Happy Jack focuses on its French-Alsatian roots, bountiful tables, and self-reliant lifestyle that inspired a restaurant legend. The story also offers a close-up of life in the Old Jewish Quarter on Rampart Street--and how it intersected with the denizens of "Back a' Town," just a few blocks away, who brought jazz from New Orleans to the world. 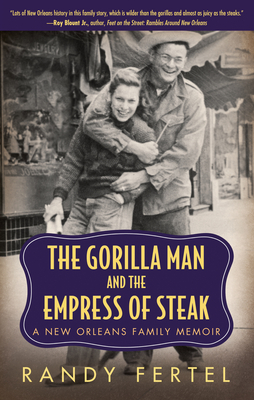 The Gorilla Man and the Empress of Steak is a New Orleans story, featuring the distinctive characters, color, food, and history of that city--before Hurricane Katrina and after. But it also is the universal story of family and the full magnitude of outsize follies leavened with equal measures of humor, rage, and rue.